A while back we blogged about the changes Vantec made to their 3.5" USB hard drive enclosures: New Vantec NexStar 3 version does not like S3000AH Intel Boards. Because the ability to remotely warm boot our servers is mission critical, we have been on the hunt for a replacement USB enclosure product. 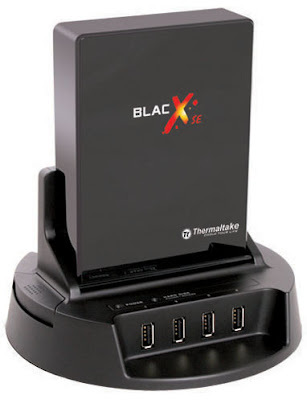 The Thermaltake BlacX SE behaves a lot like a hot swap enclosure would in the system. Power down the unit, plug in the drive, power up the unit and we have access to the hard drive and its contents. With the Vantec enclosures, there is no switch to disable the eSATA feature. Occasionally, we collaborate with Kevin of Atkey Tech. 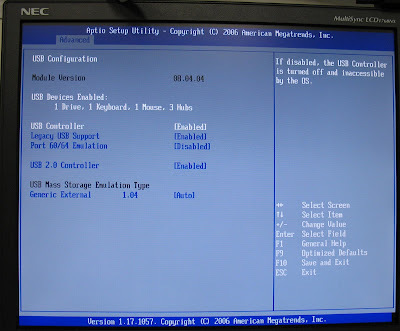 On a support call into Intel about a couple of S5000PSLSATA server board issues he was experiencing, he also worked with them on the no warm boot issue with the Vantec NexStar USB enclosures connected to the same board. In the above screen shot, it is shown enabled, because we made sure to check where the setting was at before testing the Thermaltake enclosures. While disabling that setting did work with that particular S5000PSL server board for Kevin, disabling the setting does not seem to work with the S3000AH series boards. The server we are testing on is a box that is about to go into production. It is a 1U SR1530AHLX series with a Xeon X3220 Quad Core processor and 4GB of RAM. Storage is provided by two 750GB Seagate ES.2 Enterprise Storage SATA drives in a RAID 1 array. SBS 2K3 R2 Premium is installed, configured, and fully up to date. The first thing we tried to do after the server was configured and ShadowProtect was installed was to test the warm boots against the Vantec NexStar series we have on the bench. Sure enough, the server refused to warm boot on a restart requested from the OS while the Vantec NexStar was connected. Even after a cold boot with a quick trip into the BIOS, the server would not warm boot. We installed a 500GB Seagate 7200.10 SATA drive into the BlacX SE and plugged it into the server. Once the USB detection steps completed, we had a 500GB NTFS formatted drive fully accessible to the OS. We sent the server into a reboot. The server warm booted with no issues. We cold booted into the BIOS, made a couple of on/off setting changes then saved and exited the BIOS screen into a warm boot. Again, the server booted with no issues. We then went through the same process with the Thermaltake Silver River DUO and were pleasantly surprised that the server would warm boot from any scenario. When we first started having trouble with the Vantec enclosures connected to the S3000AH series boards, we put a trouble ticket in with Vantec and began a dialogue with their support team. We have not heard from them since the end of January. 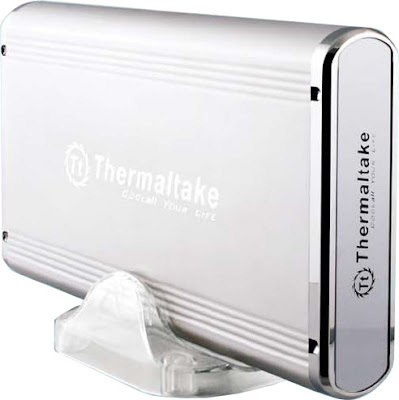 Since the Thermaltake Silver River DUO series don't seem to have the problem, it looks as though we have found a replacement enclosure for the Vantec NexStar USB hard drive enclosures. The hard drives are bare, thus exposing sensitive electronics to physical handling. The hard drives can get very hot due to a lack of air circulation. We will keep the BlacX SE around for bench work, and start using the Thermaltake Silver River DUOs for our ShadowProtect backup needs from now on. Works fine on my machines, so that will be my "standard" enclosure. It's not as ugly as it looks in the photos.